Five more days have passed, and I’ve completed another chapter draft (see snapshot below) of my proposed new book. I’ve drafted three out of ten planned chapters. The wordcount has reached 15,000, out of a planned total of 50,000. After this, I plan to dig more deeply into specific technology areas. I’ll be moving further out of my comfort area. First will be “Health”. Fortuitously, I spent today at an openMIC meeting in Bath, entitled “i-Med: Serious apps for mobile healthcare”. That provided me with some useful revision! Here’s the key question I want to start answering in this chapter: how quickly can technology progress in the next few decades? This is far from being an academic question. At heart, I want to know whether it’s feasible for that progress to be quick enough to provide technological solutions to the calamitous issues and huge opportunities described in the first chapter of this book. The progress must be quick enough, not only for core technological research, but also for productisation of that technology into the hands of billions of consumers worldwide. For most of this book, I’ll be writing about technologies from an external perspective. I have limited direct experience with, for example, the healthcare industry and the energy industry. What I have to say about these topics will be as, I hope, an intelligent outside observer. But in this chapter, I’m able to adopt an internal perspective, since the primary subject matter is the industry where I worked for more than twenty years: the smartphone industry. In June 1988, I started work in London at Psion PLC, the UK-based manufacturer of electronic organisers. I joined a small team working on the software for a new generation of mobile computers. In the years that followed, I spent countless long days, long nights and (often) long weekends architecting, planning, writing, integrating, debugging and testing Psion’s software platforms. In due course, Psion’s software would power more than a million PDAs in the “Series 3” family of devices. However, the term “PDA” was unknown in 1988; likewise for phrases like “smartphone”, “palmtop computer”, and “mobile communicator”. The acronym “PDA”, meaning “personal digital assistant”, was coined by Apple in 1992 in connection with their ambitious but flawed “Newton” project – long before anyone conceived of the name “iPhone”. I first became familiar with the term “smartphone” in 1996, during early discussions with companies interested in using Psion’s “EPOC32” software system in non-PDA devices. After a faltering start, these discussions gathered pace. In June 1998, ten years after I had joined Psion, a group of Psion senior managers took part in the announcement of the formation of a new entity, Symbian Ltd, which had financial backing from the three main mobile phone manufacturers of the era – Ericsson, Motorola, and Nokia. Symbian would focus on the software needs of smartphones. The initial software, along with 150 employees led by a 5 man executive team, was contributed by Psion. In the years that followed, I held Symbian executive responsibility, at different times, for Technical Consulting, Partnering, and Research. In due course, sales of devices based on Symbian OS exceeded 250 million devices. In June 2008 – ten more years later, to the day – another sweeping announcement was made. The source code of Symbian OS, along with that of the S60 UI framework and applications from Nokia, would become open source, and would be overseen by a new independent entity, the Symbian Foundation. My views on the possibilities for radical improvements in technology as a whole are inevitably coloured by my helter-skelter experiences with Psion and Symbian. During these 20+ years of intense projects following close on each others’ heels, I saw at first hand, not only many issues with developing and productising technology, but also many issues in forecasting the development and productisation of technology. For example, the initial June 1998 business plans for Symbian are noteworthy both for what we got right, and for what we got wrong. Set the context for decisions by potential employees whether or not to join Symbian (and whether or not to remain with Symbian, once they had joined). There were big growths in interest in computers with increased mobility, and in mobile phones with increased computing capability. Sales of Symbian-powered mobile devices would, by the end of the first decade of the next century, be measured in 100s of millions. Our phrase, “Smartphones for all”, which initially struck many observers as ridiculous, became commonplace: interest in smartphones stopped being the preserve of a technologically sophisticated minority, and became a mainstream phenomenon. Companies in numerous industries realised that they needed strong mobile offerings, to retain their relevance. Rather than every company developing its own smartphone platform, there were big advantages for companies to collaborate in creating shared standard platforms. The attraction of smartphones grew, depending on the availability of add-on applications that delivered functionality tailored to the needs of individual users. Buying and selling (tickets, vouchers, cash). By 2010, extraordinarily powerful mobile devices are in widespread use in almost every corner of the planet. An average bystander transported from 1998 to 2010 might well be astonished at the apparently near-magical capabilities of these ubiquitous devices. On the other hand, many parts of our 1998 vision proved wrong. Apple seemed to be on a declining trajectory. Samsung and LG were known to the Symbian team, but we decided not to include them on our initial list of priority sales targets, in view of their lowly sales figures. We expected to have a higher share of the overall mobile phone market (over 50% – perhaps even approaching 100%). We expected that overall phone market to remain at the level of 100s of millions per annum – we did not imagine it would become as large as a billion per year. Mobile applications to become widespread. RIM sold more and more BlackBerries, despite repeated concerns that their in-house software system would become antiquated. The in-house software systems of major phone manufacturers, such as Nokia’s Series 40, likewise survived long past predicted “expiry” dates. Factors that can overcome the restrictions and enable faster growth. Having reviewed these factors in the case of smartphone technology, I’ll then revisit the three groups of factors, with an eye to general technology. The first smartphone sales accelerator is decreasing price. Smartphones increase in popularity because of price reductions. As the devices become less expensive, more and more people can afford them. Other things being equal, a desirable piece of consumer electronics that has a lower cost will sell more. The underlying cost of smartphones has been coming down for several reasons. Improvements in underlying silicon technology mean that manufacturers can pack more semiconductors on to the same bit of space for the same cost, creating more memory and more processing power. There are also various industry scale effects. Companies who work with a mobile platform over a period of time gain the benefit of “practice makes perfect”, learning how to manage the supply chain, select lower price components, and assemble and manufacture their devices at ever lower cost. A second sales accelerator is increasing reliability. With some exceptions (that have tended to fall by the wayside), smartphones have become more and more reliable. They start faster, have longer battery life, and need fewer resets. As such, they appeal to ordinary people in terms of speed, performance, and robustness. A third sales accelerator is increasing stylishness. In the early days of smartphones, people would often say, “These smartphones look quite interesting, but they are a bit too big and bulky for my liking: frankly, they look and feel like a brick.” Over time, smartphones became smaller, lighter, and more stylish. In both their hardware and their software, they became more attractive and more desirable. Friends and acquaintances – who can be seen using various mobile services and applications, and who frequently sing the praises of specific devices. This extra word of mouth exists, of course, because of a fifth sales accelerator – the increasing number of useful and/or entertaining mobile services that are available. This includes built-in services as well as downloadable add-on services. More and more individuals learn that mobile services exist which address specific problems they experience. This includes convenient mobile access to banking services, navigation, social networking, TV broadcasts, niche areas of news, corporate databases, Internet knowledgebases, tailored educational material, health diagnostics, and much, much more. A sixth sales accelerator is increasing ecosystem maturity. The ecosystem is the interconnected network of companies, organisations, and individuals who create and improve the various mobile services and enabling technology. It takes time for this ecosystem to form and to learn how to operate effectively. However, in due course, it forms a pool of resources that is much larger than exists just within the first few companies who developed and used the underlying mobile platform. These additional resources provide, not just a greater numerical quantity of mobile software, but a greater variety of different innovative ideas. Some ecosystem members focus on providing lower cost components, others on providing components with higher quality and improved reliability, and yet others on revolutionary new functionality. Others again provide training, documentation, tools, testing, and so on. In summary, smartphones are at the heart of a powerful virtuous cycle. Improved phones, enhanced networks, novel applications and services, increasingly savvy users, excited press coverage – all these factors drive yet more progress elsewhere in the cycle. Applications and services which prove their value as add-ons for one generation of smartphones become bundled into the next generation. With this extra built-in functionality, the next generation is intrinsically more attractive, and typically is cheaper too. Developers see an even larger market and increase their efforts to supply software for this market. Decreasing price. Increasing reliability. Increasing stylishness. Increasing word of mouth recommendations. Increasingly useful mobile services. Increasing ecosystem maturity. What could stand in the way of these powerful accelerators? First, there are technical problems with unexpected difficulty. Some problems turn out to be much harder than initially imagined. For example, consider speech recognition, in which a computer can understand spoken input. When Psion planned the Series 5 family of PDAs in the mid 1990s (as successors to the Series 3 family), we had a strong desire to include speech recognition capabilities in the device. Three “dictaphone style” buttons were positioned in a small unit on the outside of the case, so that the device could be used even when the case (a clamshell) was shut. Over-optimistically, we saw speech recognition as a potential great counter to the pen input mechanisms that were receiving lots of press attention at the time, on competing devices like the Apple Newton and the Palm Pilot. We spoke to a number of potential suppliers of voice recognition software, who assured us that suitably high-performing recognition was “just around the corner”. The next versions of their software, expected imminently, would impress us with its accuracy, they said. Alas, we eventually reached the conclusion that the performance was far too unreliable and would remain so for the foreseeable future – even if we went the extra mile on cost, and included the kind of expensive internal microphone that the suppliers recommended. We feared that “normal users” – the target audience for Psion PDAs – would be perplexed by the all-too-frequent inaccuracies in voice recognition. So we took the decision to remove that functionality. In retrospect, it was a good decision. Even ten years later, voice recognition functionality on smartphones generally fell short of user expectations. Devising a set of application programming interfaces which have the right balance between power-of-use and ease-of-use, and between openness and security. Second, there are “chicken-and-egg” coordination problems – sometimes also known as “the prisoner’s dilemma”. New applications and services in a networked marketplace often depend on related changes being coordinated at several different points in the value chain. Although the outcome would be good for everyone if all players kept on investing in making the required changes, these changes make less sense when viewed individually. For example, successful mobile phones required both networks and handsets. Successful smartphones required new data-enabled networks, new handsets, and new applications. And so on. Improved phones, enhanced networks, novel applications and services, increasingly savvy users, excited press coverage – all these factors drive yet more progress elsewhere in the cycle. However, this only works once the various factors are all in place. A new ecosystem needs to be formed. This involves a considerable coordination problem: several different entities need to un-learn old customs, and adopt new ways of operating, appropriate to the new value chain. That can take a lot of time. Cause unexpected usability problems on handsets, which the user would attribute to the network operator, entailing extra support costs for the operator. The outcome of these risks of loss of revenue is that ecosystems might fail to form – or, having formed with a certain level of cooperation, might fail to attain deeper levels of cooperation. Vested interests get in the way of overall progress. A fourth problem is platform fragmentation. The efforts of would-be innovators are spread across numerous different mobile platforms. Instead of a larger ecosystem all pulling in the same direction, the efforts are diffused, with the risk of confusing and misleading participants. Participants think they can re-apply skills and solutions from one mobile product in the context of another, but subtle and unexpected differences cause incompatibilities which can take a lot time to debug and identify. Instead of collaboration effectively turning 1+1 into 3, confusion turns 1+1 into 0.5. A fifth problem is poor usability design. Even though a product is powerful, ordinary end users can’t work out how to operate it, or get the best experience from it. They feel alienated by it, and struggle to find their favourite functionality in amongst bewildering masses of layered menu options. A small minority of potential users, known as “technology enthusiasts”, are happy to use the product, despite these usability issues; but they are rare exceptions. As such, the product fails to “cross the chasm” (to use the language of Geoffrey Moore) to the mainstream majority of users. Smartphone device creation projects may become time-consuming and delay-prone, and the smartphones themselves may compromise on quality in order to try to hit a fast-receding market window. Smartphone application development may grow in difficulty, as developers need to juggle different programming interfaces and optimisation methods. Smartphone users may fail to find the functionality they believe is contained (somewhere!) within their handset, and having found that functionality, they may struggle to learn how to use it. In short, smartphone system complexity risks impacting manufacturability, developability, and usability. Technical problems with unexpected difficulty. Chicken-and-egg coordination problems. Conflicting business models. Platform fragmentation. Poor usability design. Accelerating complexity. These are all factors that restrict smartphone progress. Without solving these problems, the latent potential of smartphone technology goes unfulfilled. What can be done about them? At one level, the answer is: look at the companies who are achieving success with smartphones, despite these problems, and copy what they’re doing right. That’s a good starting point, although it risks being led astray by instances where companies have had a good portion of luck on their side, in addition to progress that they merited through their own deliberate actions. (You can’t jump from the observation that company C1 took action A and subsequently achieved market success, to the conclusion that company C2 should also take action A.) It also risks being led astray by instances where companies are temporarily experiencing significant media adulation, but only as a prelude to an unravelling of their market position. (You can’t jump from the observation that company C3 is currently a media darling, to the conclusion that a continuation of what it is currently doing will achieve ongoing product success.) With these caveats in mind, here is the advice that I offer. Expertise in implementing an entire end-to-end product solution. system integration – the ability to pull everything together, in a way that honours the core product proposition, and which enables subsequent further evolution. To be clear, I see these eight areas of expertise as important for all sectors of complex technology development – not just in the smartphone industry. In tools and processes – which are the smart embodiment of previous generations of expertise, providing a good environment to work out the next generation of expertise. Even if the underlying technology progresses quickly, the other factors required to create an end-to-end solution can fall foul of numerous unforeseen delays. First, if predictability is particularly important for a project, you can increase your chances of your project hitting its schedule, by sticking to incremental evolutions of pre-existing solutions. That can take you a long way, even though you’ll reduce the chance of more dramatic breakthroughs. Second, if you can afford it, you should consider running two projects in parallel – one that sticks to incremental evolution, and another that experiments with more disruptive technology. Then see how they both turn out. Third, the relationship between “speed of technology progress” and “speed of product progress” is more complex than I’ve suggested. I’ve pointed out that the latter can lag the former, especially where there’s a shortage of expertise in fields such as ecosystem management and the creation of business models. However, sometimes the latter can move faster than the former. That occurs once the virtuous cycle is working well. In that case, the underlying technological progress might be exponential, whilst the productisation progress could become super-exponential. The TV series “Lost in space”, which debuted in 1965, featured a manned spacecraft leaving Earth en route for a distant star, Alpha Centauri, on 16 October 1997. Arthur C Clarke’s “2001: a space odyssey”, made in 1968, featured a manned spacecraft flight to Jupiter. Skyscrapers rapidly increased in height in the early decades of the 20th century. But after the Empire State Building was completed in 1931, the rapid increases stopped. Passenger aircraft rapidly increased in speed in the middle decades of the 20th century. But after Concorde, which flew its maiden flight in 1969, there have been no more increases. Manned space exploration went at what might be called “rocket pace” from the jolt of Sputnik in 1957 up to the sets of footprints on the Moon in 1969-1972, but then came to an abrupt halt. At the time of writing, there are still no confirmed plans for a manned trip to Mars. The technological development has to satisfy a strong human need. The development has to be possible at a sufficiently attractive price to individual end users. The outcome of the development has to be sufficiently usable, that is, not requiring prolonged learning or disruptive changes in lifestyle. There must be a clear implementation path whereby the eventual version of the technology can be attained through a series of steps that are, individually, easier to achieve. When bottlenecks arise in the development process, sufficient amounts of fresh new thinking must be brought to bear on the central problems – that is, the development process must be open (to accept new ideas). Likewise, the development process must be commercially attractive, or provide some other strong incentive, to encourage the generation of new ideas, and, even more important, to encourage people to continue to search for ways to successfully execute their ideas; after all, execution is the greater part of innovation. A well-functioning virtuous cycle makes it more likely that technological progress can continue. But the biggest factor determining whether a difficult piece of progress occurs is often the degree of society’s motivation towards that progress. Investment in ever-faster passenger airlines ceased, because people stopped perceiving that ever-faster airlines were that important. Manned flight to Mars was likewise deemed to be insufficiently important: that’s why it didn’t take place. The kinds of radical technological progress that I discuss in this book are, I believe, all feasible, provided sufficient public motivation is generated and displayed in support of that progress. This includes major enhancements in health, education, clean energy, artificial general intelligence, human autonomy, and human fulfilment. The powerful public motivation will cause society to prioritise developing and supporting the types of rich expertise that are needed to make this technological progress a reality. When I started work at Psion, I was given a “green-screen” console terminal, connected to a PDP11 minicomputer running VAX VMS. That’s how I wrote my first pieces of software for Psion. A short while afterwards, we started using PCs. I remember that the first PC I used had a 20MB hard disk. I also remember being astonished to find that a colleague had a hard disk that was twice as large. What on earth does he do with all that disk space, I wondered. But before long, I had a new PC with a larger hard disk. And then, later, another new one. And so on, throughout my 20+ year career in Psion and Symbian. Each time a new PC arrived, I felt somewhat embarrassed at the apparent excess of computing power it provided – larger disk space, more RAM memory, faster CPU clock speed, etc. On leaving Symbian in October 2009, I bought a new laptop for myself, along with an external USB disk drive. That disk drive was two terabytes in size. For roughly the same amount of money (in real terms) that had purchased 20MB of disk memory in 1989, I could now buy a disk that was 100,000 times larger. That’s broadly equivalent to hard disks doubling in size every 15 months over that 20 year period. This repeated doubling of performance, on a fairly regular schedule, is a hallmark of what is often called “Moore’s Law”, following a paper published in 1965 by Gordon Moore (subsequently one of the founders of Intel). It’s easy to find other examples of this exponential trend within the computing industry. 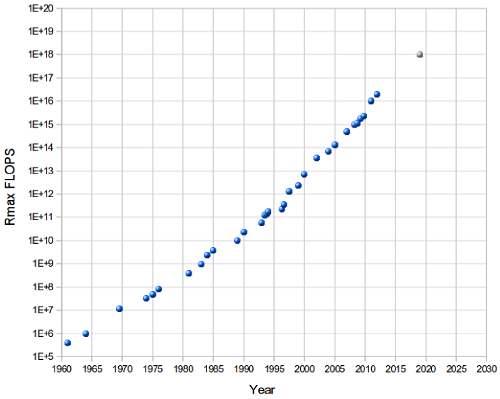 University of London researcher Shane Legg has published a chart of the increasing power of the world’s fastest supercomputers, from 1960 to the present day, along with a plausible extension to 2020. This chart measures the “FLOPS” capability of each supercomputer – the number of floating point (maths) operations it can execute in a second. The values move all the way from kiloFLOPS through megaFLOPS, gigaFLOPS, teraFLOPS, and petaFLOPS, and point towards exaFLOPS by 2020. Over sixty years, the performance improves through twelve and a half orders of magnitude, which is more than 40 doublings. This time, the doubling period works out at around 17 months. When I was an MIT undergraduate in 1965, we all shared a computer that took up half a building and cost tens of millions of dollars. The computer in my pocket today [a smartphone] is a million times cheaper and a thousand times more powerful. That’s a billion-fold increase in the amount of computation per dollar since I was a student. A billion-fold increase consists of 30 doublings – which, spread out over 44 years from 1965 to 2009, gives a doubling period of around 18 months. And to get the full picture of the progress, we should include one more observation alongside the million-fold price improvement and thousand-fold processing power improvement: the 2009 smartphone is about one hundred thousand times smaller than the 1965 mainframe. Smartphones have benefited mightily from both Moore’s Law and Cooper’s Law. Other industries can benefit in a similar way too, to the extent that their progress can be driven by semiconductor-powered information technology, rather than by older branches of technology. As I’ll review in later chapters, there are good reasons to believe that both medicine and energy are on the point of dramatic improvements along these lines. For example, the so-called Carlson curves (named after biologist Rob Carlson) track exponential decreases in the costs of both sequencing (reading) and synthesising (writing) base pairs of DNA. It cost about $10 to sequence a single base pair in 1990, but this had reduced to just 2 cents by 2003 (the date of the completion of the human genome project). That’s 9 doublings in just 13 years – making a doubling period of around 17 months. Increase in magnitude of the usable radio frequency spectrum. How much technical runway is left in these laws? Can the benefits of these laws in principle be applied to transform other industries? Will wider system effects – as discussed earlier in this chapter – frustrate overall progress in these industries (despite the technical possibilities), or will they in due course even accelerate the underlying technical progress? It depends on whether we can educate, motivate, and organise a sufficient critical mass of concerned citizens. The race is on! While indeed there are economies of scale, there are countervailing costs of complexity – the more product families produced in a plant, the higher the overhead burden rates. That sentence comes from page 92 of “The Innovator’s Prescription: A disruptive solution for health care“, co-authored by Clayton Christensen, Jerome Grossman, and Jason Hwang. Like all the books authored (or co-authored) by Christensen, the book is full of implications for fields outside the particularly industry being discussed. In the case of this book, the subject matter is critically important in its own right: how can we find ways to allow technological breakthroughs to reduce the spiralling costs of healthcare? I’m still less than half way through reading this book, but the section I’ve just read seems to speak loudly to issues in the mobile industry, as well as to the healthcare industry. These overhead costs included not just utilities and depreciation, but the costs of scheduling, expediting, quality control, repair and rework, scrap maintenance, materials handling, accounting, computer systems, and so on. Overhead comprised all costs that were not directly spent in making products. About 15 percent of all overhead costs were created by the need to repair and rework products that failed in the field, or had been discovered by inspectors as faulty before shipment. The plant hadn’t been painted inside or out in 20 years. The landscaping was now overrun by weeds. The receptionist in the bare-bones lobby had been replaced long ago with a paper directory and a phone. The manager had no secretarial assistance, and her gray World War II vintage steel desk was dented by a kick from some frustrated predecessor. Nevertheless, this particular plant had considerably higher overhead burden rates than the other plants from the same company. What was the difference? The difference was in the complexity. This particular plant was set up to cope with large numbers of different product designs, whereas the other plants (which had been created later) had been able to optimise for particular design families. If you need a product that can be made through one of these two sequences of operations and activities, we’ll do it for you at the lowest possible cost and the highest possible quality. In short: reducing overhead costs isn’t just a matter of “eliminating obvious inefficiencies, spending less time on paperwork, etc”. It often requires initially painful structural changes, in which overly complex multi-function units are simplified by the removal and separation of business lines and product pathways. Only with the new, simplified set up – often involving new companies, and sometimes involving “creative destruction” – can disruptive innovations flourish. Other companies couldn’t cope with this diversification, but we are different. But the outcome is the same as the previous case, even though different thinking gets the manufacturer into that predicament. The root failure is, again, a failure to appreciate the scale and complexity of mobile software platforms. These platforms can deliver tremendous value, but require significant ongoing skill and investment to yield that kind of result. The third failure mode is when a manufacturer seeks re-use across several different mobile software platforms. The idea is that components (whether at the application or system level) are developed in a platform-agnostic way, so they can fit into each platform equally well. Even more than a drive to scale, companies in the mobile space need a drive towards simplicity. That means organisational simplicity as well as product simplicity. In short, smartphone system complexity risks impacting manufacturability, developability, and usability. The number one issue for the mobile industry, arguably, is to constantly find better ways to tame this complexity. The companies that are successfully addressing the complexity issue seem, on the whole, to be the ones on the rise in the mobile space. Footnote: It’s a big claim, but it may well be true that of all the books on the subject of innovation in the last 20 years, Clayton’s Christensen’s writings are the most consistently important. The subtitle of his first book, “The innovator’s dilemma”, is a reminder why: “When new technologies cause great firms to fail“. Last week I visited Symbian’s labs here in London. The assembled hacks were shown some very interesting stuff, such as what could be done with a quad core mobile chipset… There was also some cool stuff with mobile-based audio EQ, which always pleases me. We also got shown some of the fruits of Symbian’s work with Scalado on the graphics front. The engineer demonstrated very quick loading of and zooming into a 21-megapixel picture, which was very impressive but raised … unanswered questions: … what precisely is to happen with this valuable work once Symbian goes open source? Given that [going open source] will involve stripping out all the third-party, proprietary stuff that can’t go open source, why is Symbian still bothering with such partnerships? Here’s my answer. First, I’m sure that there are aspects of going open source which we in Symbian have yet to think through properly. Moving some 400,000 files of source code into open source is bound to pose a whole host of unexpected problems. However, this particular question is one that has received considerable thought. Or from Symbian to V, with the costs in this case currently being covered as part of the Symbian OS licence fee paid by C to Symbian. So what happens to this licence fee F once the Symbian platform becomes open source, and there’s no longer any licence fee for Symbian platform? It turns out there are quite a few options available. For example, the Symbian platform may exclude A, but may instead include a more basic version A0. This will be good enough for many purposes – and will allow customers to build many kinds of successful phones. But customers who want particularly responsive or feature-rich behaviour in the area covered by A will be able to pay fee F directly to V, and will apply A in place of A0 in their phones. So long as the code for A is independent of the Symbian platform code for A0 (in legal terms, so long as A is not a derivative work of A0), there’s no obligation on V to licence their code using the EPL applicable to the Symbian platform itself. That is, they won’t need to make their source code available. Is this somehow at variance with the motivation of Symbian in creating an open source platform? It depends what you think the primary motivation is for this move. If you think that motivation is to drive out all cost from phones, you may be surprised by this option. However, once you realise that the main drivers are actually to lower barriers of entry and experimentation, to boost innovation, to deepen collaboration, to raise quality, and to accelerate time-to-market, you won’t be so surprised. Open source does not imply low-value! And nor does open source imply that anything which builds on top of it, needs to be zero cost. Or, from making available a chargeable new version A1 that provides even better performance and/or new features. In short, there will be plenty of ways for creative partner companies to continue to earn handsome income from their add-on and plug-in solutions to Symbian platform software. I’ll close by returning to the last part of the initial question: “…why is Symbian still bothering with such partnerships?” It’s because these partnerships collectively generate a huge quantity of impressive add-on and plug-in solutions, which allow our customers to customise and optimise their phones in numerous ways. And that’s good for everyone.